← The sun came out. 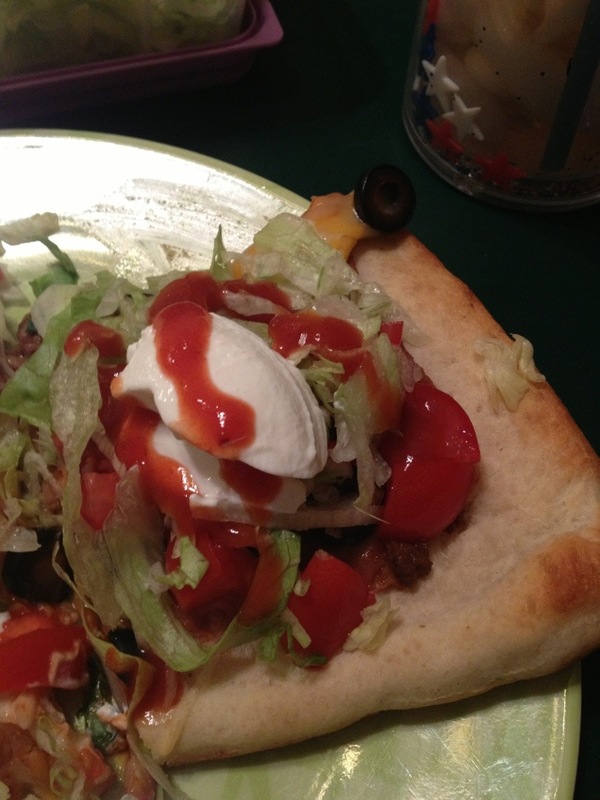 So, I’ve had my share of Mexican pizza in my day, but none were as delicious as the one I made for dinner tonight. It was made up of mostly leftovers, and a few simple things I had to pick up while doing my weekly grocery shopping. I used a Pillsbury pizza crust from the refrigerated section. Not healthy. But, delicious. 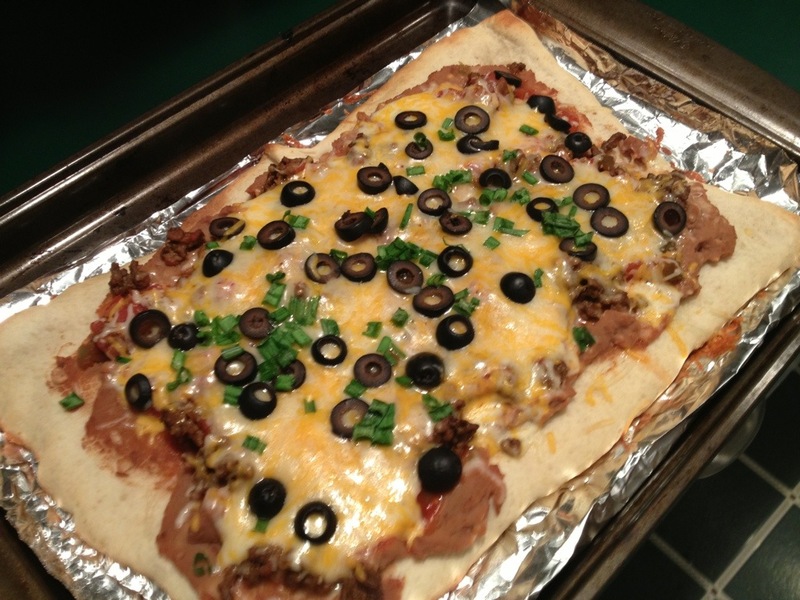 Then I spread refried beans on the crust. On top of that I put the leftover taco meat, and salsa. Then, I topped with Mexican Four Cheese Mix. I also sliced black olives on top, and some green onions. 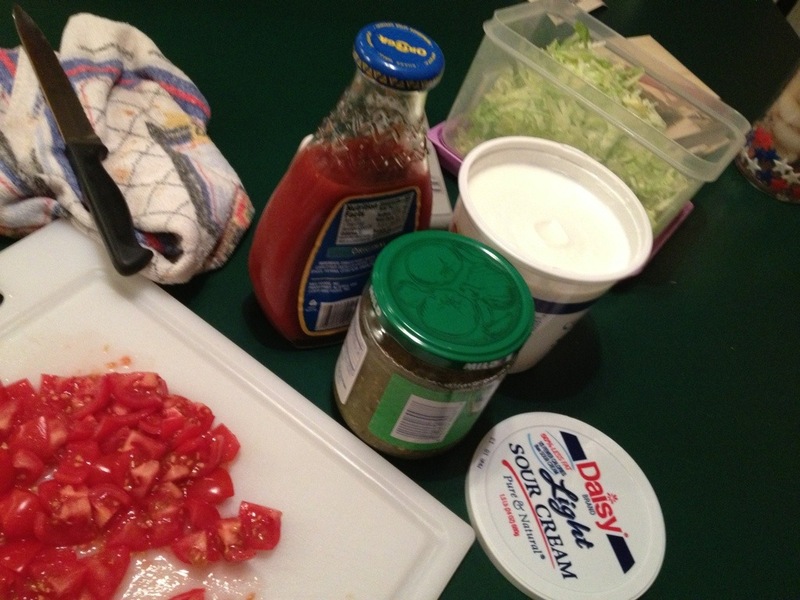 After it was cooked, I topped it with chopped tomatoes, shredded iceberg lettuce, low fat sour cream, and some taco sauce. It was so delicious, and I stayed in my calorie count for the day!! YAY. Here are some pictures of my delicious dinner!!! I had a restless night’s sleep, as I’ve had a lot on my mind. I am throwing a party for my brother next weekend, and the guest list has gotten huge. My husband and I became overwhelmed with imagining the logistics of all of those people at our house at once. So, I talked with my parents, and they helped me come up with a compromise. We changed the party to an open house that lasted from afternoon to evening. That way, people can come and go throughout a longer time period. And then, not everybody will be there at once. I am feeling a lot less stressed about the party now. Also helping alleviate my stress was a long walk with a very good friend. I am hoping it is the motivation I need to get the ball rolling with exercising…. I also went to a funeral this afternoon for a former student. She was 27 years old, and it was a tragic story. The funeral was really devastating and really remarkable. I say devastating, for obvious reasons, but remarkable seems like a weird word to describe a funeral. The remarkable part was the way the Catholic community in my town supports each other. It’s one of the main reasons I choose to live here, and work at the Catholic elementary school. It was a beautiful tribute to her, and the funeral really left you with a sense of who Rachel was as a person. Her boyfriend of four years eulogized her, as well as her parents. The recessional was very awesome. It was “When the Saints go Marching In,” played by a band with brass and drums. It filled the church. You heard it in your heart. They chose this because Rachel did disaster relief after Hurricane Katrina in the Mississippi Delta, and she came to love the culture there. Well, I am rather exhausted, so I am going to sign off. Have a good evening….well, what’s left of it. This entry was posted in Uncategorized and tagged catholic community, cheese, funeral, home body, live life, mexican pizza, refried beans, shredded iceberg lettuce, sour cream, taco meat, taco sauce, walk. Bookmark the permalink.